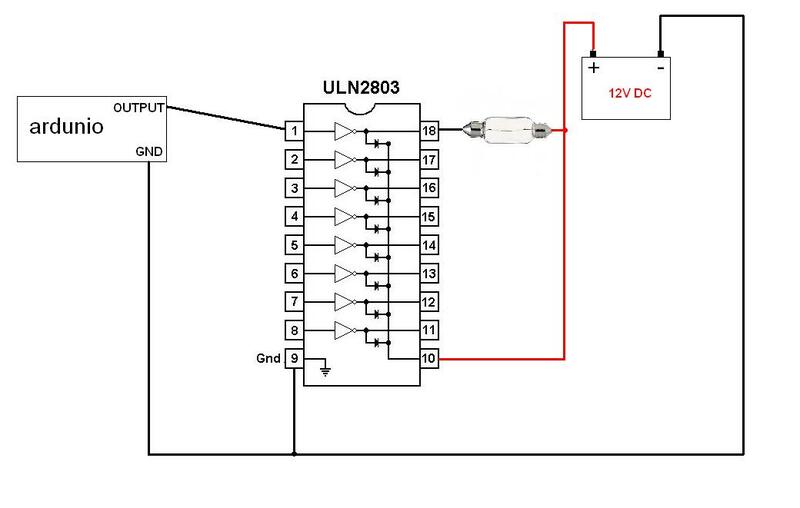 stupid question, will my ULN2803 circuit work? Discussion in 'Electronics & Electrics' started by oculi, May 5, 2015.
will this circuit using a ULN2803 work? took me a while to remember that the symbol in the IV is just a not gate, and the diodes are for flyback, which is handy because i don;t need to remember which way to hook them up externally. Yeah looks good, but those ULN2803 are only good for 80mA or so so be carefull. You might want to parallel up several channels if it requires more current than that. Alternatively if you only have a single load, try to get the hang of a low side N type mosfet drive. Very simple circuit and easy to drive with logic level mosfets. cheers, I need the voltage more than the current, will be using it to drive a relay maybe which it should do easily. Just curious, is the relay then driving a high voltage circuit, or is it still 12V? A much better IC is TPIC6B595 this is a serial in parallele out shift register with 8 FET outputs you only need 3 pins of the Arduino to get as many outputs as you want. Has high current outputs of 150ma per output with all outputs on, made to drive relays. With these you can get more outputs just by adding more TPIC6B595 in series. 500mA sink per output, total current 2.5A. We used zillions of them to drive lamps. Sorry, my mistake. I used one couple of months ago and thought I had remembered the specs. cheers for that, may look at them in the future, only looking to control a few things at the moment and I don't mind using all of the output pins for that. How many outputs from the Arduino do you need? You might need to look at current limiting resistors on the outputs? wired this up, works great on the relays! I just bought a relay board on ebay (I will be using it for other than arduino purposes). It appears to even have opto isolator whatsits and they are cheap. Search for relay board ardunio. Cool. FWIW I think there are solid state relay versions too.